The dynamic duo behind Footprint Press -- Rich & Sue Freeman -- have revised and expanded one of their most popular titles. 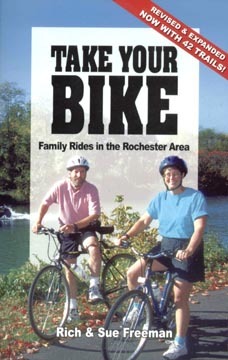 Take Your Bike scores extra points for truth in advertising, since it is a guidebook for the best places to, well, take your bike in the Rochester area. The guidebook is packed with maps and details for 42 bicycling trails, the very best places to ride in Niagara, Orleans, Monroe, Wayne, Livingston, Cayuga, Ontario and Seneca Counties. Learn where to park, how long you'll be riding, amenities to find along the way, and the type and difficulty of terrain to expect. The trails range from easy, paved bike paths to more rugged mountain biking trails. Learn local history and discover new places to ride, even if you've been a life-long resident. This example, from Orleans County: "Just east of Medina, off Route 31, Culvert Road passes under the [Erie] Canal. Featured in Ripley's Believe It Or Not, it's the only road that passes under the Erie Canal. Built in 1823, it's an interesting sight and worth the side trip to take a look."